Last month, the team in charge of 10gen's Ruby driver for MongoDB ran into a few concurrency bugs, reported by a customer running the driver in JRuby with a large number of threads and connections. I've barely written a line of Ruby in my life, but I jumped in to help for a week anyway. I helped spot a very interesting performance bug in the driver's connection pool. The fix was easy, but thoroughly characterizing the bug turned out to be complex. Here's a record of my investigation. The Ruby driver's pool assigns a socket to a thread when the thread first calls checkout, and that thread stays pinned to its socket for life. Until the pool reaches its configured max_size, each new thread has a bespoke socket created for it. Additional threads are assigned random existing sockets. When a thread next calls checkout, if its socket's in use (by another thread) the requesting thread waits in a queue. # new socket if max_size not exceeded. # Otherwise, wait for the next socket. # Return a socket to the pool. When a thread returns a socket, it signals the queue and wakes the next thread in line. That thread goes to the top of the loop and tries again to acquire its socket. The bug is in checkin: if the next thread in the queue is waiting for a different socket than the one just checked in, it may fail to acquire its socket, and it will sleep again. When I first saw this I thought there must be the possibility of a deadlock. After all, if threads sometimes call checkin without really waking other threads, mustn't there come a time when everyone's waiting and no one has a socket? I wrote a Python script to simulate the Ruby pool and ran it for a few thousand ticks, with various numbers of threads and sockets. It never deadlocked. So I had to stop coding and start thinking. Has returned its socket and will never ask for it again. To deadlock, all threads must be in state 2. To reach that point, we need N - 1 threads in state 2 and have the Nth thread transition from 1 to 2. (By definition it doesn't go from state 3 to 2.) But when the Nth thread returns its socket and signals the queue, all sockets are now returned, so the next awakened thread won't wait again—its socket is available, so it goes to state 1. Thus, no deadlock. Thread 1 has Socket A checked out, Thread 2 has Socket B, Thread 3 is waiting for A, Thread 4 is waiting for B, and they're enqueued like [3, 4]. Thread 2 returns B, signals the queue. Thread 3 wakes, can't get A, waits again. At this point, Thread 4 should be running, since its Socket B is available, but it's waiting erroneously for Thread 1 to return A before it wakes. So we changed the code to do queue.broadcast instead of signal, so checkin wakes all the threads, and we released the fixed driver. In the future, even better code may prevent multiple threads from contending for the same socket at all. The bugfix was obvious. It's much harder to determine exactly how bad the bug was—how common is it for a socket to be unused? If N=S=10, threads never wait but there's some fake "inefficiency" due to the 1-second sleep. 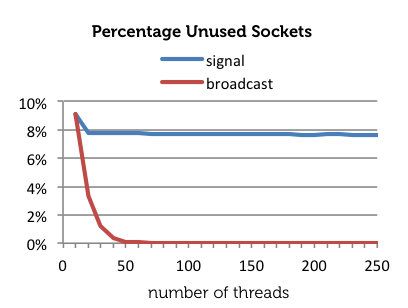 For larger numbers of threads the sleep time becomes irrelevant (because there's always another thread ready to use the socket), but signal adds an inefficiency that declines very slowly from 8% as the number of threads increases. A pool that uses broadcast, in contrast, can saturate its sockets if it has more than 30 threads. I spent hours (mostly on planes) trying to determine why the inefficiency factor acts this way—why 8%? Shouldn't it be worse? And why does it fall, slowly, as N rises? But I'm calling it quits now. Leave a comment if you have any insights, but I'm satisfied that the old pool was wasteful and that the new one is a substantial improvement.